Overall, I'd say that my basement shop is pretty well-equipped, though there's always room for another power or hand tool. Some purchases I'd make again, others perhaps not. Either way, it continues to be fun, and it all begins here with this panoramic shot. The centerpiece of my shop is the table saw. I have the Craftsman contractor saw below. Although the Craftsman brand takes a beating on the various woodworking message boards, I've been happy with the saw. I have made a few modifications beginning with the replacement of the right cast iron wing with a laminated insert. While the open wing on the left comes in handy for clamping featherboards, the one on the right just snagged material that was being cut. I also enclosed the legs with plywood to collect sawdust as well as provide surfaces for mounting various accessories. On the left are numerous saw blades, on the front are push sticks and featherboards, and on the right side are wrenches, a taper jig and various accessories. This has worked out well. A crosscut sled is behind the saw, and the fence slots make it easy to attach a sacrificial fence. In terms of safety, a zero-clearance insert is used, and I replaced the small switch with a much safer alternative. You can see from the photo to the right that the new switch is much easier to turn off than the old switch that often required my blindly searching for it to turn the saw off. I also have had success with a foot peddle that I use to turn off the saw when making cuts of larger sheet goods. Improving the saw's performance is a Forrest WWII saw blade that cuts splinter-free and leaves glue-ready edges on stock. The Forrest Dado King is also about the best dado set you can get, also providing splinter-free crosscuts in any material I've tried cutting. Highly recommended. 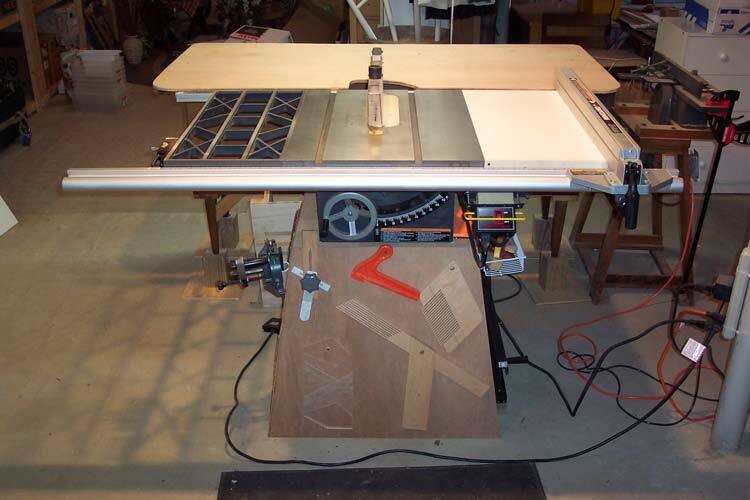 One of the best uses for an old dresser is its conversion to an outfeed table for the table saw. In addition to providing a large outfeed surface, the dresser also provides a good amount of storage as you can see from the drawer labels. I fashioned some leg supports out of 4x4 stock to raise it to the saw height. 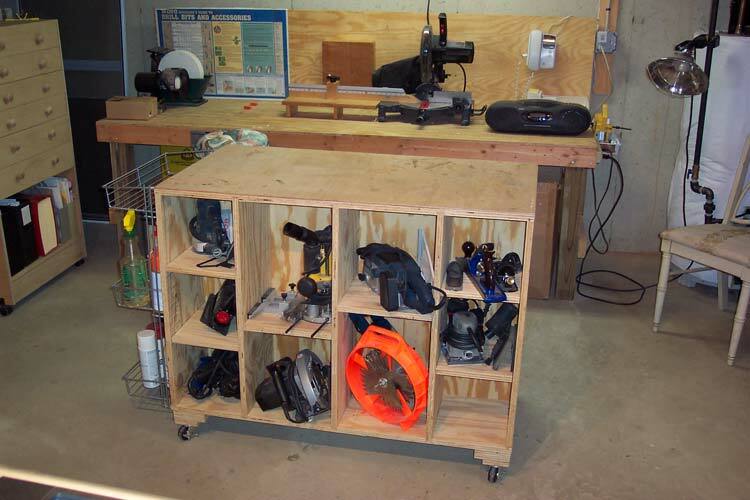 Opposite the table saw is an assembly table on wheels that also doubles for tool storage. On both sides are shelves where I keep a number of smaller tools and accessories handy, including the Dado King dado set as well as my Bosch belt and orbital sanders which I really have been happy with. You'll also find a circular saw, various drills and planes, a palm sander and a DeWalt 621 plunge router which is great. Its integrated dust collection really works, and much better than anything else out there that I've read about. Though it's not fancy, one of the first things I needed to build was a tool cabinet on wheels. 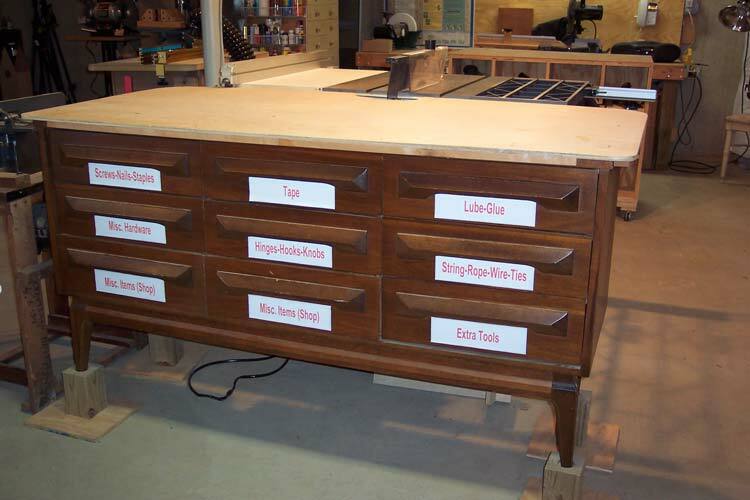 This is where most of the smaller hand tools and sanding paraphernalia are kept, including measuring tools et. al. In the bottom is where I keep the binders for the manuals and various articles, as well as an accordion file that keeps the various sandpaper grits organized (great idea!). You can see it in the left of the picture above.